Concrete foundations that have cracks and actively leak water are best repaired using an expanding polyurethane foam. If the interior surface of the foundation wall is wet and will not dry, then using the Acta-Leak Concrete Crack Repair kit is the best way to stop the leak. This kit will also work on hairline cracks as narrow as 0.002″ in width. High pressure concrete crack injection is needed to get the polyurethane resin into such a tight crack. Make your basement dry and stop the leaks with our proven basement crack repair materials. Applied Technologies provides premium concrete foundation crack repair injection materials for both professional and DIY customers. The Acta-Leak Kit will repair all basement crack leaks in concrete. 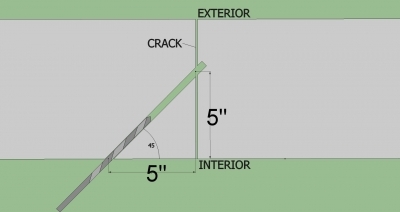 Cracks as narrow as 0.002″ in width can be injected. As well as cracks that have been previously repaired or are leaking water during the repair. 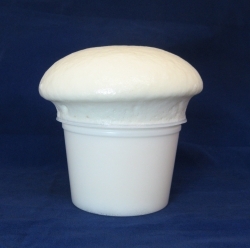 Hydra Stop 300 polyurethane foams on contact with water and expands inside the crack, sealing out water. Hydra Stop 300 expands 20-30x its initial volume after contact with water. Drill in place mechanical packers are used to get the Hydra-Stop 300 into the crack. These withstand the high injection pressures generated by the grease gun. Packers do not need any glue or surface paste to adhere. The packers prevent the polyurethane from leaking out of the hole during injection. This diagram shows the proper way to prepare the holes prior to inserting the packers. Use a 3/8″ masonry drill bit to make the holes.